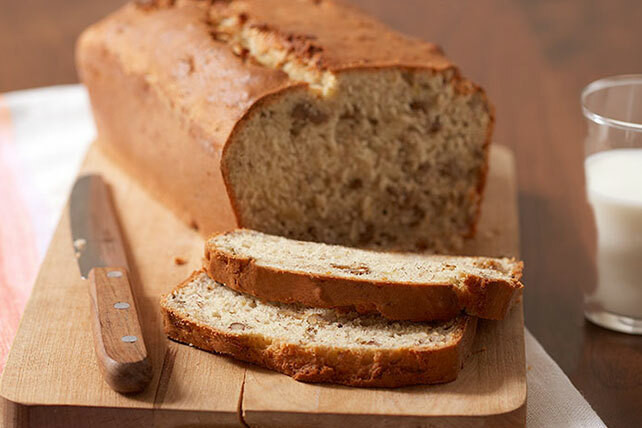 Caramel bits and chopped walnuts add sweet nuttiness to this quick bread. It's super moist, too, thanks to the fully ripened bananas and sour cream. Combine flour, baking powder, baking soda and salt. Beat butter and sugar in large bowl with mixer until blended. Add bananas, sour cream and eggs; mix well. Add combined flour mixture; mix just until moistened. Stir in nuts and caramel bits. Bake 1 hour or until toothpick inserted in center comes out clean. Cool 5 min. Remove bread from pan to wire rack; cool completely. Prepare batter as directed; spoon into 16 paper-lined muffin cups. Bake 22 to 24 min. or until toothpick inserted in centers comes out clean. Cool in pan 5 min. Remove to wire racks; cool slightly or to room temperature. Prepare batter as directed; pour into 5 (6x3-inch) foil pans sprayed with cooking spray. Bake 30 min. or until toothpick inserted in centers comes out clean. Makes 15 servings.